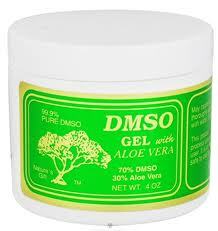 DMSO Gel 70/30 Aloe, UnscentedDimethylsulfoxide (DMSO) is a byproduct of wood processing for papermaking. It is a somewhat oily liquid that looks like mineral oil and has a slightly garlicky odor. Because it is an excellent solvent, it is widely used as a degreaser, paint thinner, and antifreeze.